With the Detroit Red Wings leaving the Central Division this season, many were left with the wonder if the division will still have that rivalry feeling. The aggression between Chicago and the St. Louis Blues has always been evident, but less tense than with Detroit. This season’s battles have elevated the Central Division rivalries to a new intensity. Detroit’s leaving the division left a gap for the Blues to fill in. They have provided heated on-ice wars since their NHL inception, though this season saw them push the defending champs much further. The Blues were a smart pick to make a hard push this year, and they did just that. During the regular season they took three of the five games they had with the Blackhawks, with two coming in overtime. That may not sound impressive for St. Louis, but they controlled most of the play that isn’t seen in the statistics. During the post-season, Chicago dropped the first two games to the Blues and had to come back with four straight wins to take the series. Two of Chicago’s wins came in overtime, and four of the six games in the series were decided with extra time. In fact, the first game of the series, in which Chicago lost, went into triple overtime to start the playoff season. While Chicago got the upper hand on the Blues overall, St. Louis has put a heavy dent in Chicago’s armor and has shown that they can push the champions to the ropes on a regular basis. Chicago’s second playoff series also went to six games with another Central Division foe. 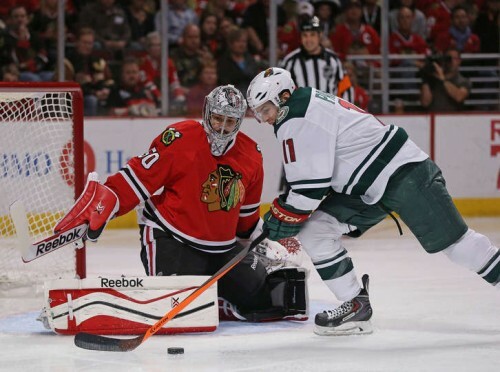 The Minnesota Wild dropped the first two games to the Blackhawks, but came back to tie the series. Again, Chicago had to push back to take the series, with another overtime win. During the regular season, Chicago didn’t have as much luck. Minnesota took three of the five games the two teams had during the regular season. One of Chicago’s wins had to come through a shootout, and that game was at home where Chicago plays best. While there will be moves in the off-season, Ryan Miller already leaving St. Louis, the confidence levels of both Minnesota and St. Louis is high when it comes to facing Chicago. The Blackhawks are still a strong team, but everybody behind them is starting to catch up. The Central Division is becoming a dominant force, and to lead the pack will take far more talent, skill, and a little more luck than in past seasons. The rivalries between the teams have been re-ignited. Believe that both Minnesota and St. Louis will remember the blows they struck on the defending champs, and Chicago will have to remember the drive it took to overcome both foes.